When SayItSocial first moved to TekMountain @CastleBranch, we were eager to prove our digital prowess. Prior to moving to our new ultra modern office space, Brett Martin (Founder/CEO of CastleBranch and primary investor and overseer of TekMountain) was nominated for the North Carolina Technology Association’s (NCTA) “Tech Exec of the Year Award” for his dedication to growing the tech culture in Wilmington. 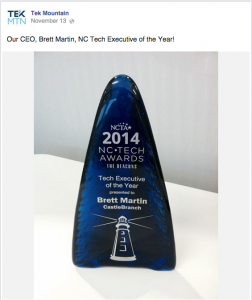 This award is presented annually by the NCTA whose mission is to make NC number one in technology and make technology number one in NC. The NCTA has over 700 member companies, organizations, and institutions representing over 100,000 NC based employees. Brett wanted to win it, and we wanted to help him. We immediately sprung into action – developing and executing custom social media campaigns, guerilla marketing tactics, and digital PR strategies. 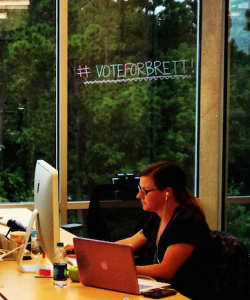 Our overall mission was to earn votes for Brett by increasing local awareness of his dedication to improving various aspects of the Wilmington business and local communities. Pretty soon, #VoteForBrett was written all over the glass walls of TekMountain, and the campaign was underway. Despite some stiff competition, Brett emerged victorious! We at SayItSocial hope to help add to the momentum behind developing #ILM as a hub for startups and technology throughout the year.